When I think back on the NES era, the Ninja Gaiden series stands out for having gorgeous cinematics, tough as nails gameplay, and amazing music. The first game had one of the most engaging stories of the 8-bit era. And while the second wasn’t as strong in the narrative department, it introduced a lot of gameplay mechanics that made for a much more engaging experience. A few weeks back, I talked about the use of speed in Mega Man 2 and today, I want to talk about how the developers at Tecmo played with weather to create some very inventive levels for Ninja Gaiden II: The Dark Sword of Chaos. The music beat begins. Two characters are in a standoff against the backdrop of a full moon. They start racing at each other. Swords slash. One survives, one falls. 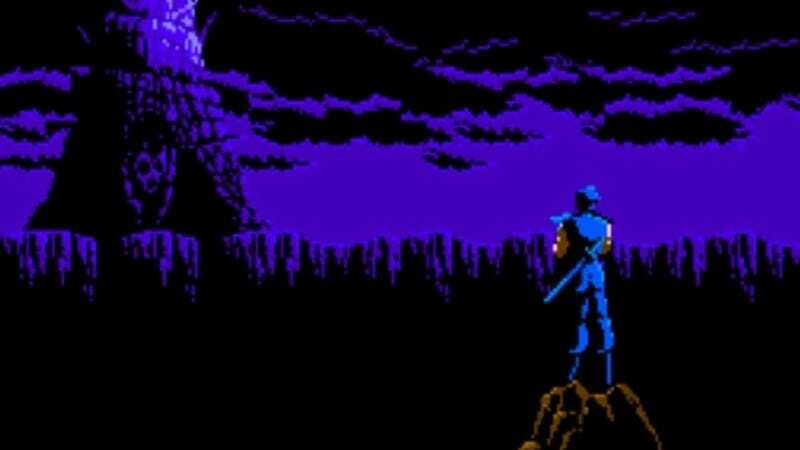 Ninja Gaiden changed gaming with its stunning cutscenes. The second game was published by Tecmo in 1990 and begins with a new threat, Ashtar, the Emperor of Darkness. Wind is blowing, lightning strikes, and he is in a moody and villainous pose. He begins monologuing about his grand evil plan to open the Gate of Darkness so that he can rule the world, bwa ha ha! Ninja Gaiden has a reputation for its brutal difficulty. While 2 is also very challenging, there were two new upgrades that made the experience much more manageable. The first was that Ryu could split his body and have two invincible phantom Ryu’s to accompany him. The second was that he could directly climb walls so that mistimed jumps no longer required self-sacrifice (or a bunch of tiny jumps to try to climb up). There’s also a lot more variety in the levels compared to the first. One of the stages has Ryu racing across a moving train and another has flowing water that tugs and pulls him in various directions, leading up to a fight against an underworld water dragon. The stages that stood out for me were the ones that used the weather, especially since it’s Ryu’s ability to master his environment that really brings out the ninja in him. In stage 2-2, Ryu is racing across a mountainous area that is extremely windy. Snow is coming down and the direction of the wind is represented by the small white sprites that move in three directions. Downwards represents neutral, while dropping from screen upper right to lower left pushed Ryu in the corresponding direction. In the neutral motion, Ryu moves at regular speed. When the wind is moving in the same direction Ryu sprints, the pixels speed up to 2.5 pixels per frame. Going against wind slows him down to 0.5 pixels per frame. This leads to some interesting level design choices. Often, when Ryu is in the heat of combat, the wind will shift, either pushing him into the foe, or away from it. The placement of the cliffs also can lead to some tricky spots with unintended motion leading to an enemy collision. In the first area, there is a gap that can’t be crossed by a normal jump. Ryu has to time it so the wind is blowing in the right direction to leverage an extra horizontal push. Immediately after he makes the leap, there’s an enemy awaiting. Ryu has to slash him, but not rush down the drop. Rather, he must slow down and dispose of the blob on the wall. This is because soon after this descent, he has to climb up the wall on the other side. If that blob is still there, it will hurtle projectiles his way, making it difficult to avoid damage. The wind creates gameplay opportunities for the designers to teach players not to rush, but rather to proceed carefully, just as a ninja would. In the second screen, there is a barrage of enemies, from the Jason-like knife wielders to the machine gunners and the extremely annoying birds. Even without the wind, it’s hard. But if you try to rush through, Ryu will end up taking a lot of damage. With wind pushing you back, enemies continually respawn at a rapid rate as well, so you still have to press forward. Fortunately, power boosting items like the art of the fire wheel and fire dragon balls can incinerate foes and really help you get through this part in a nice mixup of earth, wind, and fire. The third and final screen is the shortest. The trickiest part is using the wind to drop to a lower level, either by timing the jump perfectly, or clinging to the wall, descending, and letting go at the right moment so that the wind can direct Ryu to safety. In the fight against the stage boss, Baron Spider, wind becomes a huge impediment. If Ryu is fortunate to still have the fire power items, he can cling to the wall, which makes him impervious to the wind, then launch a flurry of attacks. If not, the battles become much more challenging. Baron Spider will hurtle tarantulas at Ryu and vault from the lower to the higher level. The arachnids will race up the wall and harm Ryu. Any time Ryu jumps at the Baron, the wind will either make him crash into the boss or force him away, making it difficult to strike. I remember struggling through this battle and pumping my fists when I finally won. Wind, together with spiders, made for a very difficult opponent. Stage 3-1 has one of the most creative uses of weather because of the way it plays with light and darkness. The entire area is shrouded in shadows, preventing you from seeing what’s ahead of Ryu. Short flashes of lightning reveal the path, but there are holes everywhere that result in Ryu’s death. The lightning comes at regular intervals and it’s difficult to know where to go since enemies are continually charging at Ryu. Random fireballs hover towards him and irksome bats fly in waves that are hard to hit, especially when he’s leaping through the air. This area resulted in a lot of deaths. Enemies pop out from both sides of the screen while some of the ledges are very slim. A misplaced jump will result in a loss of life and a reset to the beginning of the stage. There’s one jump near the end of a series of small isles where an enemy lumbers slowly towards the player. It’s a cheap death if Ryu jumps into him in a race to catch the lightning. I was frustrated, but thematically, I loved the idea of the ninja being able to fight through the darkness and use the weather to navigate his way. It also foreshadowed the physical darkness that would enshroud the world if I, as Ryu, failed in my mission. The urgent need for light was punctuated in its ominous absence. Eventually, all the deaths led to pattern recognition/memorization and my awareness of the obstacles the stage had in store for me helped me to reach the end. There was no hand-holding, no easy escapes from the developers at Tecmo, which made success feel all the more sweeter. Ninja Gaiden 2 had lots of death packaged into its 8-bit frame. Even the box cover warns, “Hard to beat! !” But it’s one of the best games on the NES, wrapped together by a super catchy soundtrack. Finishing it felt like a true accomplishment. Being a ninja was an arduous journey and I don’t think I’d have wanted it any other way.